English. This might be a bit biased for me to say, but the simple fact is that it’s one of the major languages of the world today. With America and Britain as two of the world’s leading developed countries, not knowing English would make life difficult. Fortunately, there is always a chance to learn. Study by APP has recently developed an education app titled ESL Review (ESL stands for “English as a second language”) for people with intermediate English skills, who want to bring their skills up to advanced (or at least high intermediate) level. It focuses on general topics (see below) and can be used by anybody regardless of age. Choosing any of the below topics will allow you to access a lecture, at least 50 flash cards, followed by a Chapter Test usually consisting of 35 questions. Once you’re done taking tests, you see which sections you need to work on in “What I Need To Study” at the bottom of the list, which generates multiple choice questions based on incorrect choices made while taking the Chapter Tests. You can also resume your tests at any time, but can only be taking one at a time. If you tap on the Statistics button down at the bottom, you can see just how well you’re doing on the tests, down to the very last minute. Judging from the tone and the questions, ESL Review is more for serious students of English rather than people who just want to do it for fun. Developed by a professor with four years of ESL teaching experience, ESL Review strives to help people strengthen their English skills through challenging tests and is well worth the $3.99. Of course, only so much can be learned from books and tests–the real test is getting out in the real world and applying your knowledge. AppSafari review of ESL Review was written by Julie Guan on February 7th, 2011 and categorized under App Store, Education. Page viewed 6469 times, 3 so far today. Need help on using these apps? Please read the Help Page. English might be the most spoken language of the world but still there are countries where most people don’t speak or know English. 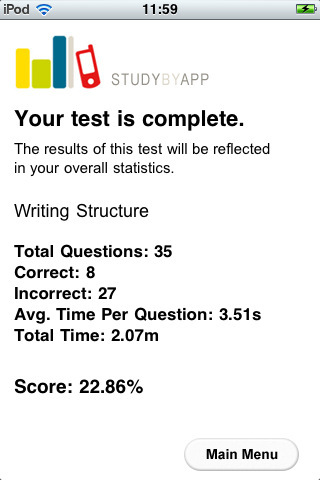 This iPhone app would be very useful for them and also to people who are preparing to write the IELTS exam. Nice application, Thanks for sharing.